OpenWay Group has been supporting the Indonesian payment leader ever since Finnet migrated to the WAY4 Switch platform nearly a decade ago. 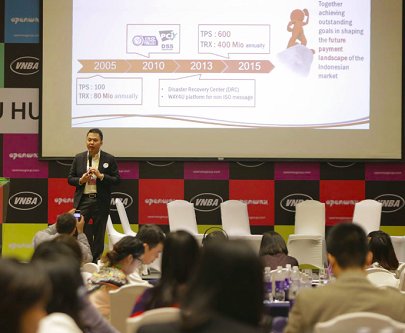 “During these years OpenWay has proved to be a reliable and supportive partner,” says Erman Suherman, Operation, IT & Innovation Director, Finnet. The WAY4 Wallet solution is aimed at developing financial services in the virtual and e-money environment. This innovative product has strategic value for banks that are putting an emphasis on attracting and servicing clients through the Internet and mobile applications. The product will be presented at the leading international exhibition - CARTES 2012 - in Paris during an OpenWay workshop that will take place on November 6 at 11:15 in room 2. Mobile and internet channels are becoming more and more popular as the first choice of cardholders for the way they get service. This is a serious reason to re-examine the approach to providing retail banking services. The WAY4 Wallet solution makes it possible for banks to attract other banks' clients and get fee revenue from servicing their cards through mobile phones and the Internet. Client service is possible not only through the bank's Web portal or application on a client's mobile device but through any Internet spaces or social networks. Moreover, thanks to WAY4 Wallet, a visitor to the portal or mobile phone owner can become a bank client without even setting foot in a financial institution: this is done online in a matter of minutes while observing a high level of security. Thanks to the built-in mechanism for target marketing and cross-sales, the bank is able to approach current and potential clients directly, offering them new products and services. In the virtual personal office, clients can manage their cards, make payments and transfers, receive targeted offers from the bank and respond to them, all from a single point of entry. Using state-of-the-art channels - Internet and mobile phone - WAY4 Wallet can acquire any card: prepaid, credit or debit regardless of the issuing bank. WAY4 Wallet can be used as a personal office in which cardholders can associate their cards, obtain virtual cards and manage them, make financial operations, create any payment templates and receive personal messages from the bank. OpenWay, a global provider of payment processing solutions for banks, telcos, processors and government agencies, announces the successful migration of Advanced Info Service Plc. (AIS) “Refill-On-Mobile” solution to WAY4. Today, WAY4™ manages all prepaid phone mobile-refills and bulk purchases for AIS. The OpenWay team replaced AIS's legacy system with WAY4™, establishing greater PIN security and offering an enhanced multi-level agent-based USSD top-up together with a host of other pioneering features, asserting OpenWay’s leadership in providing secure and high-performance transaction processing solutions. In addition to the benefit of enhancing the existing top-up features, WAY4™’s solution framework presents a string of business possibilities which allow AIS to innovate and bring new features to the market quickly. "WAY4™ is an excellent illustration of how AIS brings together the best of breed enterprise solutions to deliver new levels of service experience to our business partners and mobile subscribers. We leveraged on OpenWay’s experience in secure payment transactions and WAY4™’s flexible solution framework to enhance our mobile refill system and to cater to the dynamic and rapidly growing business. Since then the transaction volume has increased by more than 30% and AIS agents have doubled." says Tay Yeow Lian, Vice President, Product Development, AIS. What is WAY4™ Mobile Top-up? WAY4™ Mobile Top-up is a mobile refill transaction processing solution from OpenWay. It has been designed to work with mobile solutions to process high-volume transactions and provide the necessary transactional and system security and reliability. Rich and proven in functionality, WAY4™ Mobile Top-up is best qualified to meet the needs of telcos in transaction management and to support innovation in mobile services. Advanced Info Service Public Company Limited (AIS), a subsidiary of Shin Corporation PCL., is the established leader in Thailand’s wireless communications industry after more than 15 years of services with its market share more than 50%. To date, AIS service network covers 795 districts (Amphur) throughout Thailand, plus international roaming across in six continents. AIS has continuously enhanced and expanded its network in order to respond to the market and technological advances, whilst keeping abreast of consumers’ growing demands and needs. It continues to integrate the latest in advanced technology and deliver more than just voice communication, with GPRS and EDGE technology. AIS strongly believe that wireless communications bring changes to the way Thai people live their life, regardless of who they are and what they do. With endless communications possibilities, the quality of life is better.